Located at an altitude of 7,350 ft, Ooty is a green paradise amidst the scenic Nilgiri mountain ranges of south India. Also known as Ootacamund or Udhagamandalam, Ooty is the most beautiful and charming hill station in south India and rightly so it's referred as the "Queen of hill stations". Ooty is famous for its lofty mountains, lush green hills, sprawling grasslands, cascading waterfalls and sparkling brooks, all making it a picture perfect hill resort of India. The sprawling tea gardens on the hill slopes offer a spectacular view to its visitors. Visit and explore this enchanting hill resort of India on your Ooty tour with India Tours and Packages. We assure that you would always relish and remember your fascinating Ooty Tour with us. Ooty offers plenty of tourist attractions to its visitors. The major tourist attractions at Ooty include the Ooty Lake, Botanical Gardens, Rose Garden, Lamb's Rock and Dodabetta Peak. In addition, there are many beautiful picnic spots in Ooty including the Wenlock Downs, Ninth mile and Sandy Nallah. These spots in Ooty are quite favorite for film shoots. Ooty also organizes a number of carnivals all through the year with most famous among them being the annual Tea and Tourism Festival in January, and the Ooty Mariamman in April and May. Boat Races, Summer Festival and Dog Shows are organized during the festivals. By Air: Coimbatore (88 km) is the nearest airport from Ooty. Flights are available for Coimbatore, Bangalore, Cochin and Chennai. 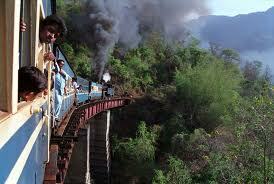 By Rail: Ooty has a railway station, which is just 2 km from the City Center. Mettupalayam (46 km) is the other important railway station near Ooty. There is also a toy train that connects Ooty with Mettupalayam and Coonoor, another famous hill station. By Road: Ooty has a very good road network and is well connected by road with major towns and cities of Tamil Nadu.